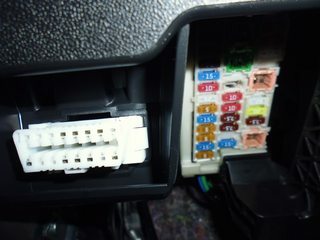 I'm trying to fit a dashcam (hardwired) to a 2017 C1 and despite the manual telling me the fuse box is behind a panel inside the drivers door - I can't open the panel or find the fuse box. I pulled the door seal out, removed the panel to the right of the accelerator, the undid the bolt to release the next panel - but when pulled the dash felt like it was coming away. I thought the fuse box is behind the speedo? Last edited by NoscopeDog on Wed Apr 03, 2019 2:55 pm, edited 1 time in total. It is located drivers side to right of OBD socket under dash, best seen from drivers footwell looking up and has white plastic cover that pops off. Search for Peugeot 108 interior fusebox on here to see more pics. Steve107 - thank you sir, now found! The manual doesn't help at all! No worries, agree owners manual had me confused at first, but I found it eventually!